Arts and crafts can be enjoyable and beneficial for people of all ages, from children and adults to senior citizens. However, you need to pick appropriate activities for seniors, since the activities that children enjoy are often too juvenile for seniors to enjoy. There are a variety of ways to find arts and crafts activities for seniors, and with a little bit of research and communication with the person you’re doing the project with, you should be able to find an ideal project fairly quickly. Use the Seniorville crafts and hobbies website to find suitable arts and crafts ideas. Seniorville provides various links to arts and crafts ideas for seniors ranging from simple projects that can be completed in a short period of time like making paper flowers for decoration, to long-term projects like making a scrapbook or crocheting a picture. Seniorville also offers links to other sites regarding indoor and outdoor activities like yoga, bird-watching and water aerobics for seniors. While many seniors are perfectly healthy, others may have physical limitations that can affect how they can work with arts and crafts projects. For example, crocheting or needlepoint may not be appropriate for a senior with arthritis because it could be very difficult and cause pain. That person may, however, be able to comfortably make a watercolor painting because the hand movements involved aren’t as repetitive. In fact, that type of movement could actually help reduce joint pain and stiffness. When you’re helping a senior find an arts and crafts activity, you need to identify physical limitations. If you’re unsure whether an arts and crafts activity is safe for a senior you’re working with, ask his doctor and monitor the person’s comfort level as he performs the activity. Arts and crafts activities are beneficial for seniors with all stages of Alzheimer’s disease and dementia, but you’ll need to pick the right activities. Try doing activities that can be done in short periods of time and then stopped if necessary, and avoid activities that require those you’re working with to concentrate for long periods of time, which could be difficult for them. Small watercolor paintings, taking nature pictures with an auto-focus camera or making a rubbing with construction paper and a charcoal pencil are all excellent ideas. 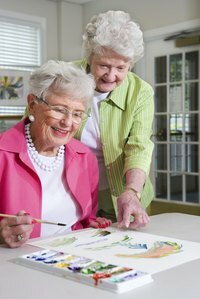 Whether you’re dealing with one person or a group, seniors will want to have a say in what arts and crafts projects they do. Unlike dealing with children, seniors are likely to have stronger preferences when it comes to what they find interesting, challenging and enjoyable. Open a dialogue and try to figure out what arts and crafts projects the person or group you’re working with would be interested in. Paper crafts or embroidery may be interesting for some, while others may prefer to make a scrapbook, draw a sketch or make a watercolor painting instead. Be sure to review your directions and try out the craft yourself before instructing others how to. Take your time when providing directions to seniors.